May 1, 2005 -- Tonight's episode of ABC's "Grey's Anatomy," written by Krista Vernoff, included an extraordinary scene in which a veteran nurse character guided one of the interns through treatment of a life-threatening cardiac tamponade. This is the kind of informal teaching of new physicians that experienced nurses commonly do but that Hollywood almost never shows, and we give the show credit for showing it. Unfortunately (you knew this was coming) the episode still manages to suggest that the intern alone saved the patient's life. 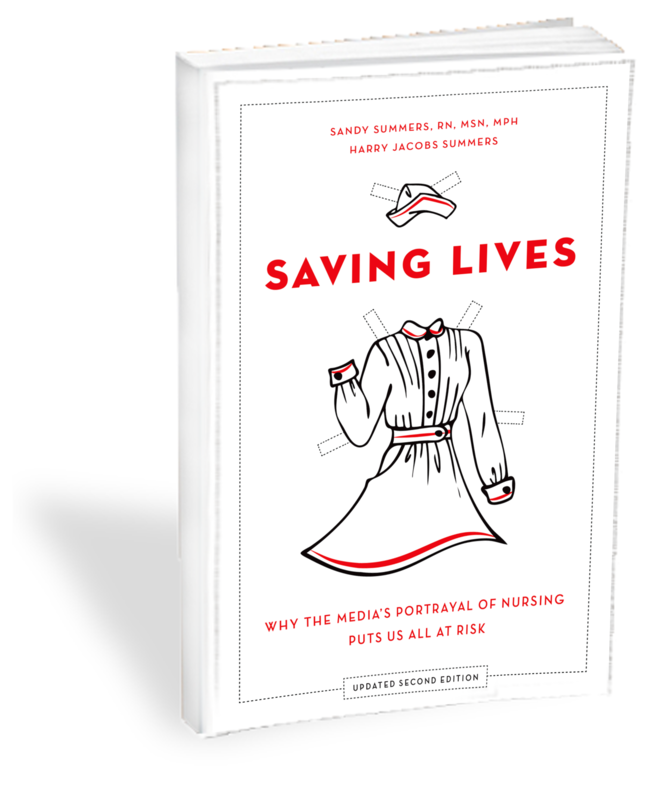 It presents the unnamed and unrecognized nurse as a kind of humanoid how-to card, rather than a skilled professional whose expertise was the most critical factor in the patient's survival. When the episode isn't crediting physicians for work that nurses really do, it portrays them as physician helpers. The medical consultant was Karen Lisa Pike, MD. In this episode, "If Tomorrow Never Comes," the cardiac tamponade scene is another "intern's first code" scene, this time for intern character Izzie. An earlier episode did the same for lead character Meredith Grey, and the most striking element there was the echoing plea of a nurse to the intern: "You need to tell us what you want to do!" Izzie's scene here is a complete, almost shocking reversal. Like Meredith, Izzie panics when confronted with the crashing patient. But instead of flailing in a sea of dependent nurses, Izzie is immediately rescued by the voice of experience, in the form of an older female nurse who calms her down, diagnoses the problem in collaboration with the ultrasound technician, tells her exactly what should be done, and guides her through the procedure. (As it often does, the show screws up several things from a technical standpoint, but we're concerned here with what the mass audience will perceive.) Despite the importance of the nurse's lines, the director still focuses almost entirely on Izzie's struggle, and the nurse's instruction is largely in the background. The nurse is not named or identified as a nurse, she gets virtually no close-ups, and Izzie--one of the nicer characters on the show--does not thank her, or even give her a meaningful look. However, the show clearly does believe thanks are in order. In a later scene, after Izzie has described her ordeal to attending Burke, he tells her: "You saved his life." Sure--just like the actors make the show by themselves. On the whole, this scene had great potential, and with a script and direction that did not work so hard to give Izzie all the credit and de-personalize the veteran nurse, it could have been excellent. Elsewhere, there is more of the usual. The episode has physicians and patients' families handle all bedside care (and no, it's not a sly comment on nurse short-staffing). Physicians and families provide all emotional and physical support to the patients, and the physicians provide all support to the family members. In one scene, surgical intern Meredith is actually shown walking a post-op patient. In another, intern George is shown drawing blood and preparing for an EKG to help prepare a patient for surgery. Of course, in reality nurses (or unlicensed assistants) do all that. When nurses do appear here, they are typically providing physical assistance to the physicians, who carry on personal conversations as if the nurses are not there. Aside from the code scene described above, the only other scene in which a nurse gets a significant line features nurse Tyler. Tyler is a younger black man we have referred to in prior analyses of "Grey's Anatomy." Perhaps an example of the show's diversity efforts, Tyler is the only nurse character that we have seen emerge, always briefly, from the show's wallpaper; last week, an attending even called him by name! And he was the one to demand that Meredith tell the nurses what she wanted to do in the earlier code scene mentioned above. This week, Tyler is again in petulant underling mode, demanding that the overburdened Izzie do a central line, check an X-ray, do post-op notes, and tell another nurse whether to start feeding a patient. Then Tyler announces he is going on break. When Izzie asks him to page another physician, Tyler snaps that he has already paged the physician. Those nurses--too busy with their precious breaks to do what's necessary for patients. Of course, in today's actual short-staffed environment, both nurses and physicians tend to be stressed out, to the detriment of caregivers and patients alike. But as always, the focus here is all on Izzie's problem--it's her world, Tyler just lives in it, and is one of the many annoying things she has to deal with. On the upside, we believe this was the first episode of "Grey's Anatomy" that did not feature one of the interns making an expressly anti-nurse comment. How excellent is that? See our most recent analysis on our "Grey's Anatomy" action page and send our most recent instant letter to the show. It just takes a minute. We all sent almost 800 letters out so far (190 original). Please help us increase that to 1250 this week. Thank you! After you have sent a letter, please go to the ABC "Grey's Anatomy" message board and post your comments or your letter to change the way the fans think about the show, to help pressure "Grey's Anatomy" to either improve or get off the air.